Didn't even dream such a day would dawn, did you ? 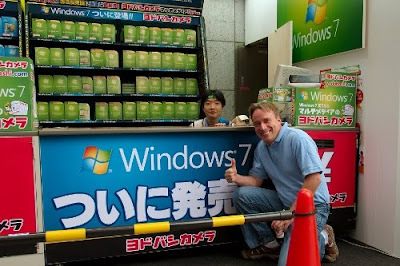 Now here is the father of Linux posing before a Windows 7 stall in Japan with a thumbs up sign. The occasion was a Linux Symposium held in Japan in which Linus Torvalds was an attendee. Microsoft knowing about the Linux Symposium erected a Windows 7 promotion booth right across the venue. During the break, when Linus Torvalds was dragged to the Windows 7 booth by a few of his buddies, he chose to pose as seen in the picture. If you are wondering, No! Linus didn't buy a copy of Windows 7.